A malfunctioning gate can make it very difficult to get in and out of your home, and we know how frustrating that can be. Our team will work hard to make sure that whatever problem you have won't be affecting you for long. You can count on us to keep your inconvenience at a minimal level, and to get your gate working again as soon as possible. Automatic gates use an opener just like overhead garage doors do. Both of these systems can experience the occasional malfunction with their motorized unit, but our dedicated team knows exactly how to get things back on track when something goes wrong. If your gate is slamming into the end of its track, or if its sensors are failing to detect an obstacle and force the system to open, our technicians will take care of things. We'll adjust the limit switches as necessary, and realign the sensors to keep you and your vehicle safe. If the opener's motor gear wears out, you can count on us to replace it in no time at all. Because our technicians are highly experienced with all types of gate system we’re able to offer a wide range of different repair services. 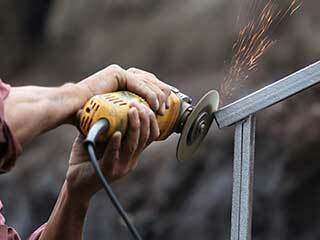 These include hinge welding repairs, adjustments and calibration of your track system and even intercom installation. Our experts will be happy to help you choose a new system that uses audio, video or both to communicate with visitors. The last thing any business owner wants is for potential customers to have a trouble entering or leaving. If you rely on shipping and receiving products at a fast pace, a problem with your gate can reduce your effective work flow, and even bring it to a halt. To prevent this from happening, you need someone to help you out quickly and not waste any time. That's what our technicians will do. We'll get to you as fast as we can and resolve whatever issue is causing your gate to misbehave. The different gate repair services our team can offer you will make sure any problem you're experiencing will be fixed in as short a time as possible. Contact our experts at Garage Door Repair Vista whenever you need any type of professional assistance.